2010 ACT Championships - Bliznyuk wins! A quick game from tonight's round of the ANU Chess Club Autumn Rapid. Lee Forace (who will be an arbiter at the Doeberl Cup) found a nice checkmate against Jamie-Lee Guo, but only after Jamie-Lee castled into the mate. Lee however was pleased by his effort. "For the blog" he said when handing a copy of the score sheet to me. Pairings for the first round of the 2010 O2C Doeberl Cup Premier are available at both the tournament website (Click on the results link) and at www.chess-results.com. The Schools teams events in Canberra traditionally start with the girls events in Term 1. The logic behind this is that the girls teams get to warm up against each other, before unleashing havoc in the Term 2 Open events. The two events were the ACT Girls Secondary Championship and the ACT Girls Primary Championship, and the finals of both were played over the last few days. The Secondary Championship is run as an individual swiss, with the team score calculated by adding up the scores of the best 4 players from each school. Lyneham High were the winning team, finishing ahead of traditional girls powerhouse Alfred Deakin High. The Primary Schools was played in the more traditional 4 board format, with the final consisting of 23 teams (from a qualifying pool of 70+ teams). This years winner was Curtin Primary (making it at least 3 wins in a row), ahead of Turner Primary, with Radford edging out Amaroo for third on tiebreak. Next term sees the Open Schools events, with the Primary Schools qualifying sections attracting close to 1000 players over the 6 zones. Full results from this year (and past years) can be found at the ACTJCL website. The 2010 O2C Doeberl Cup is only a few days away, and the entries have crossed the 230 mark. Wednesday 31st March 2010 is the deadline for entries, but you can enter after this date, as long as you are willing to sit out the first round (ie Entries by the deadline will be paired for round 1, late entries will be paired for subsequent rounds). In the Premier there are currently 10 GM's and 10 IM's entered, with 23 players from overseas federations (important for norm hunters). One player who is coming into the tournament on the back of some good form is Indian IM Saptarshi Roy Chowdrey. He has just finished first in the Six Seasons GM Tournament in Bangladesh and I'm assuming his score of 7/9 is good enough for a GM norm. His stand out game from the tournament was the following effort, where he demolished his opponent in 19th Century style. Former World Champion Vassily Smyslov has passed away at the age of 89. He was hospitalised with chest pains early last week, a died yesterday (27 Match 2010) in Moscow. He was World Champion from 1956 to 1957 1957 to 1958, and was the first player to wrest the title from Mikhail Botvinnik. Although his career seemed to decline after his 19571958 World Championship rematch loss to Botvinnik, he bounced back in spectacular fashion in the 1980's, reaching the 1984 Candidates Final, before losing to Gary Kasparov. In 1991 he won the first World Seniors Championship, and in later years was a problem composer of some renown. One of the first Smyslov games I was aware of was the from the 1945 USA-USSR Radio Match. In his game against Sammy Reshevsky, both players followed established theory in the Open Lopez, up until the point where Smyslov uncorked a new 18th move, which surrendered the queen for a fair amount of wood. On move 23 the Americans radioed for a time check in the game and were astonished to find that Smyslov had only used 2 minutes up until that point. It turned out that Smyslov had access to better analysis than Reshevsky, and a demoralised Reshevsky wasn't able to cope with the complications and lost. The Melody Amber tournament in Nice finished in a tie for first between Magnus Carlsen and Vasily Ivanchuk. While Ivanchuk was the only player to go through the event undefeated, Carlsen lost 6 games, although his 11.5/12 against the bottom 6 finishers made up for this. However the player who proved best at the blindfold section was last minute replacement Alexander Grischuk. Filling in for Alexander Morozevich, Grischuk scored 8/11, losing only one game to Lev Aronian. His last round game against Carlsen helped decide the final standings, as well as showing one of the occasional pitfalls of blindfold chess. On move 25 Carlsen simply lost track of the White queen and played the losing capture on e4! With a large percentage of chess players these days having access to the internet, the trend is for tournament organisers to publish a list of entries prior to the event. Of course some organisers can feel embarrassed if the list consists of 2 or 3 players a week out from the tournament, but overall it is a good thing (As an aside I know of one player who makes his decision about whether to play, not on the strength of the field, but on how many d**k h***s are playing). Of course there is a risk that what is published as the list of entries may not actually be the final list. This is normally due to changed circumstances of players (especially overseas players) although the organisers of the 2010 Australian Championship sailed very close to the wind by publishing a list of early entrants before most of the names on the list had even thought about entering (or in 1 or 2 cases, even knew the event was being held). While this years O2C Doeberl Cup has not resorted to "bearing false witness", the entry list for the Premier has had some minor modifications. One popular player from overseas, GM Shojaat Ghane, had intended to come but travel difficulties put paid to that. If he had made he may have had a chance to repeat his victory from last month against GM Vladmir Malaniuk, who is the third seed for the event. "Strategic Behavior across Gender: A Comparison of Female and Male Expert Chess Players" is the title of a new research paper that well, compares the strategic behaviour of Female and Male Expert chess players. One of the arguments made in the paper is that male players are less risk adverse that female players, and that male players will even take more risks against female players than they do against male players of similar strength. I initially came across the paper here, which discusses its conclusion in relation to risk behaviour on Wall Street (and other investment environments). I'm not sure how much of the papers conclusions are transferable (given the limited reward structure in chess ie win, loss, draw) but it is an interesting approach nonetheless. Coincidently, Susan Polgar links to another article concerning gender and chess, although this is more about participation levels, and the disparity between the number of male and female players. "Stamps and Marxism" was Karpov's famous reply to a question concerning interests other than chess. 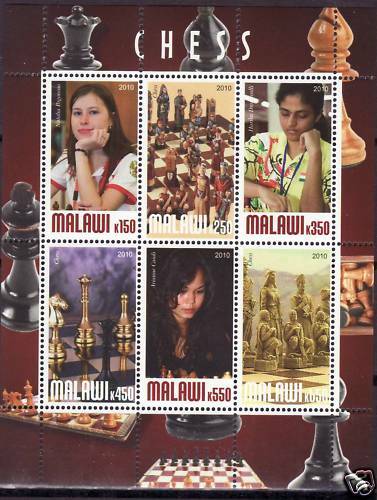 I can't give you Marxism (you'll have to ask Obama for that), but courtesy of Milan Ninchich, I can show you some stamps from Malawi that celebrate chess. 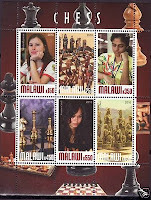 The three pictures of the female players probably come from the 2008 Chess Olympiad, and include Australian representative Arianne Caoili (bottom centre for those with poor eyesight) . In yesterdays post I referred to the Zhao - Rujevic game from the 1999/2000 Australian Championship. This game was interesting in that during the game Zhao played an illegal move (Rook jumps Pawn) which was not noticed by either player. It was however noticed by a spectator (John Pascoe) who did the right thing by informing the Chief Arbiter (Me actually) about what he had seen. As the game was in the Australian Championship (rather than say an under 10 tournament), and neither player had said anything, I (incorrectly) dismissed the claim. The truth was revealed at the end of the game, to the shock of both players, when a replay confirmed what John Pascoe had seen. Interestingly I have heard about this happening more often than I would normally expect. It is as though both players 'expect' that the game will follow the rules, and therefore don't scrutinise the legality of every move. The diagrammed position is a very recent example of this. 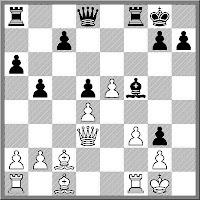 Two moves previously Black's pawn on a5 stood on a7, and White's pawn stood on b5. 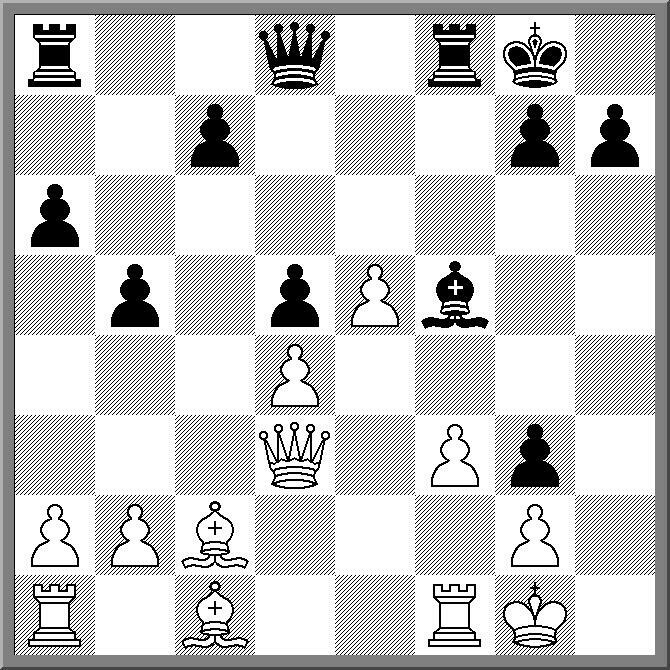 Black then played a7-a5 to which White replied b5xa6ep. 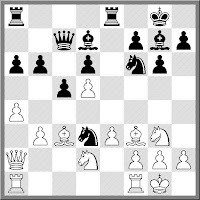 However instead of removing the a pawn, he confidently lifted the b pawn from the board. Black, who I believe was at the board when this happened, didn't sense anything was amiss, and the game continued on as though nothing untoward had happened. It was only a couple of days later that White realised what he had done, and again when told, Black was genuinely surprised that he had also missed this. One of my opponents in the Dubbo Open was John Pascoe. 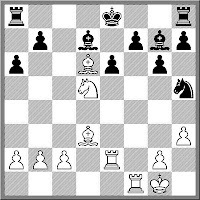 I first met John at the 1999/2000 Australian Championship, where he attempted to alert me to an illegal move played in the Zhao - Rujevic game (a story I will relate in another post). John, who is approaching his 80th birthday, also happened to be the Secretary of the Canberra Chess Club way back in the late 1940's. A couple of my old Chess World magazines mention him in this role, which he maintained until moving to Sydney in 1951. Against me he played a solid opening but fell for a paradoxical tactic where his d pawn was better off being protected by a piece, rather than a pawn. The top two seeds at the 2010 Dubbo Open ended up sharing the spoils after 6 rounds of enjoyable chess. After starting with 4 wins each they drew their round 5 clash, before both winning in round 6. In the final games GM Zong-Yuan Zhao defeated 3rd seed FM Vladmir Smirnov and IM George Xie defeated WFM Emma Guo. Guo, who was the winner of last years Balyney Open, played both winners during the tournament, and finished on a credible 4/6. Third place was shared by Smirnov, Nicholas Deen-Cowell and Alana Chibnall on 4.5/6. As it was the 10th Dubbo Open, the organisers had organised a large prize list, which ran all the way doen to 7th, plus various ratings prizes. This meant that there was a huge tie for 6th, including Fritz Van Der Waal, who was crowned NSW Country Champion. Here is the last round game between Alana Chibnall and Allen Setiabudi, which resulted in Alana grabbing a share of third. The 2010 Dubbo Open (number 10 in the series) has attracted a record field of 48 players. Headlining this years tournament were the two players who dominated this years Australian Championship, GM Zong-Yuan Zhao and IM George Xie. And at the end of the first day both players are on 3/3 (along with a couple of other players). In round 3 George was the beneficiary of my horrible opening knowledge, after I left out an important intermediate move. Attempting to transpose into a Sveshnikov Sicilian, I played the very dubious 7.Bg5 instead of the normal 7.Bf4 e5 8.Bg5. This meant I didn't have access to d5 and after giving up the 2 bishops, my position quickly went downhill. And it wasn't only Xie who I was being helpful to. In the evenings lightning event I lost to young Anton Smirnov in the final round, giving him first place and a nice bottle of wine (which no doubt will be going to dad Vladmir). Over the past week I've been searching for information on the 2010 Anand v Topalov match. Partly for blogging purposes, but also because at least one member of my local chess club will actually be in Sofia during the first week of the championship (on business he claims!). Thinking that the official site would be the best place to start, I was surprised to find there was no official site. That was until earlier today when the 2010 World Chess Championship site went live. But it does have all the usual goodies that chess websites have, including playing schedule, live games, and lots of pictures. However the one thing I couldn't find was the reason I searched for it in the first place. Ticketing information. The European Individual Championship has just finished, with a win for Russian GM Ian Nepomniachtchi on 9/11. The organisers of the event (the European Chess Union) seemed to have followed the lead of other zonal organisers by making the tournament open to any player registered by a European Chess Union country, regardless of strength. This resulted in a field of 408 players for the Open Championship and 158 players in the Women's Championship. Despite the huge fields the organisers didn't seem tempted to use accelerated pairings, probably because (a) 11 rounds was enough to cope with the field (3 rounds more than the minimum needed) and (b) there were a number of GM's who started in the bottom half of the field! If you want to see the full details from the events (including the number of GM's IM's etc) then click on the links for the results for the Open and Womens Championships. Occasionally a player will lose enough games in the same way as to get their name attached to the losing method. 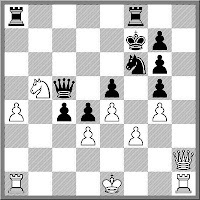 In Canberra chess circles Peter Gmizic manged to do this in the late 80's through a couple of quick losses. The characteristic feature of these losses was an early queen move to f6 where it got hit with Bg5 and eventually trapped. After it happened a couple of times the expression "To Gmizic your queen" was born. Here is a more up to date example, with the name of the loser redacted (because I'm a nice guy). 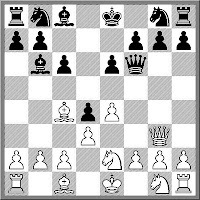 All the features are there, the queen on f6, the bishop coming to g5, but in this case Black could save the queen at the cost of material and the position. However he chose not to, resigning instead. Back in 1996 I was in San Francisco (on my honeymoon) and I spotted a group of chess players playing in the street. In the end I passed up the chance to play as (a) I was afraid of getting 'hustled' and (b) I was on my honeymoon. In the end I probably shouldn't have been so timid (or considerate) as based on this article, they were probably just a bunch of enthusiasts enjoying the game. There is an assumption from players not that familiar with blindfold chess that it is very easy to lose track of the position. I even read a story once about how a group of players attempted to so the seeds of confusion in a blindfold simul by starting with different first moves but transposing into the same position after 4 or 5 moves. The simul player dealt with this by taking a bathroom break, and climbing out the window into the night. Nothing so drastic for Magnus Carlsen, although his first move against Vassily Ivanchuk (1.a3!) looked like an attempt to baffle his opponent. 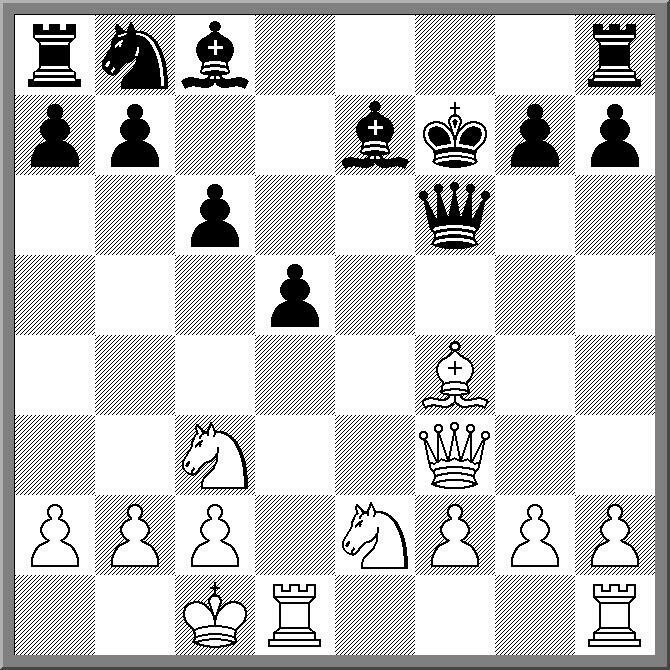 However Ivanchuk was not confused and instead demonstrated an even more important blindfold tactic on move 31. "Play the best move in the position"
Normally the Canberra chess year gets off to a slow start, but this year has been very different. The ACT Championship has already been run and won, and the O2C Doeberl Cup is only 3 weeks away. Squeezed in between this are a couple of tournaments, including the Autumn Junior Weekender, which was held yesterday and today. The Autumn Weekender was the brainchild of Ian Rout a number of years ago, and serves both as a warm for juniors planning to play in the Doeberl Cup, and as a gentle introduction to tournament chess for juniors who are making the step up from schools chess. The tournament was won by Allen Setiabudi, fresh from his heroics at last weeks ACT Championships. Although I don't have complete scores to hand, I believe that second place was shared between Megan Setiabudi and Yijun Zhang. Although it is about 400km away from Canberra, next weeks Dubbo Open is always popular with ACT players. This year is the 10th edition of the event and GM Zong Yuan Zhao and IM George Xie are both playing in the event. Then a weeks break (for those not coaching) and then the Doeberl Cup. Entries have passed the 150 mark and significantly, there are only 18 spots left in the Premier. And finally for the very keen, there is the Sydney International Open starting on the Wednesday after the Doeberl. Throw in the ANU Masters (for a small group anyway) and it would be possible to play 36 FIDE rated games in the March/April period, a feat previously unachievable in Canberra chess. Only light blogging for the moment as I seemed to be plagued by network connectivity problems (cf the missing thursday post). For some reason websites seem slow/unreachable while time wasters like World of Warcraft are still available! One of the chess calendars more interesting events begins tomorrow in Nice. The 2010 Melody Amber tournament brings together 12 of the worlds top players in a combination rapid/blindfold event. While the tournament is half serious/ half vacation for the participants, I suspect there is still a a certain kudos in winning the event, especially the blindfold half. Given there is no official 'Blindfold World Championship' this is the closest thing to it. The field is headed by Carlsen, Kramnik and Aronian. Missing from this years event are Anand and Topalov, who are preparing for their upcoming World Championship Match. Live coverage starts at 14:30 Nice time, which I am guessing is currently 1:30 in the morning Canberra time. However there are 4 playing sessions a day, and the later sessions should still be running as the sun comes up. In a subject dear to my heart, FIDE have announced their revised anti-doping regulations. They've been re-written to bring the FIDE code into line with the 2009 WADA Anti-Doping code. I've had a quick skim but nothing really jumped off the page to me, although I do wonder how seriously they will manage out of competition testing (10 players rated above 2650 will be subjected to this). Of course with all these things the real issue isn't how the players follow the regulations, but how FIDE itself follow the regulations. So far their track record hasn't been that good. In what is clearly a good sign for Australian chess, the traditional Ballarat Begonia Open attracted a record field of 123 players. This 7 round event is still run in a single section, meaning that determining an outright winner can be a bit tricky in an unmodified swiss. Therefore it was run as an accelerated swiss, although as the last Olympiad showed, acceleration often moves the round 1 mismatches up to round 3. One player who received a harder than expected first round pairing was WFM Emma Guo. Passing on the ACT Championships (she had committed to Ballarat before the ACT Champs details wear announced) she had to play top see IM Stephen Solomon in round 1. Even with acceleration, the winning score was still 6.5/7, acheived by FM Erik Teichmann. There was a 3 way tie for second between IM Stephen Solomon, IM Leonid Sandler and FM Bobby Cheng, all on 6. The 2010 ACT Championships came to a dramatic conclusion today when Junta Ikeda, who had lead the tournament from the start, stumbled in the final round and lost to Allen Setiabudi. This meant that Andrey Bliznyuk, who had trailed by half a point going into round 9, finished in front of Ikeda after defeating Adrian De Noskowski. Bliznyuk was the only player not to lose a game, and finished with 3/3 over the last 3 rounds. Third place was shared by Allen Setiabudi, Yi Yuan, Mos Ali and Pete Morriss. The diagram shows the moment that decided the championship. Ikeda had just played 57 ... Qb5-c5 and Setiabudi pounced with 58.Qg5+ After 58 . ... Qxg5 59.fxg5+ Ikeda had the choice of 59 . 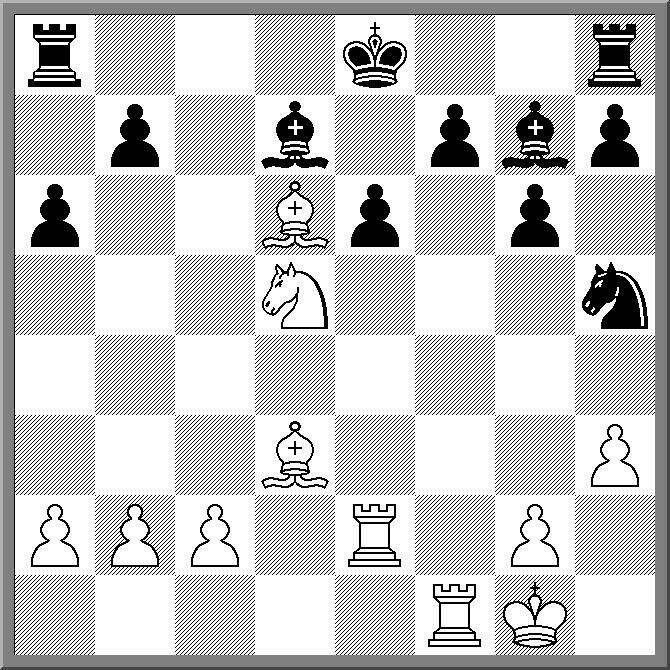 ... Kxg5 which loses to 60.Kg3 or 59 . ... Kg6 (which he played) hoping for 60.Kg3?? which draws after 60. Kxg5. However Setiabudi was awake to any tricks and followed up with 60.Kh3 and won in a few more moves. Full crosstable and games from the event are available here. Junta Ikeda is the leader going into the final round of the 2010 ACT Championships. He and second place holder Andrey Bliznyuk are the only 2 players who can win the title, with third placed Ian Rout and Adrian De Noskowski a point and a half behind Ikeda. Today saw the leaders play some particularly tough games with Ikeda salvaging an interesting draw against Rout (see below) before defeating second seed Yi Yuan in the days second game. Bliznyuk won both his games, the second being a theoretical double rook ending with only an extra rook pawn on the board. The final round is being played tomorrow, with Ikeda needing only a draw for a share of the title. In round 4 of the 2010 ACT Championship, Milan Grcic played an anti-Pirc line that involved Be3 and Qd2. 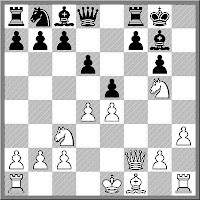 His opponent attempted to exploit this by playing Ng4 to attack the dark squared bishop. After the bishop headed to g5 it was hit by h6. But rather than retreat the bishop, Grcic attacked the knight instead, to open the h file. He then shifted his knight to g5, followed it up with Q to the h file, and it was all over in 15 moves! Amazingly in round 6 of the tournament his opponent tried the same idea, got hit with the same reply, and although he varied from the round 4 game (7. ... f6 instead of 7. 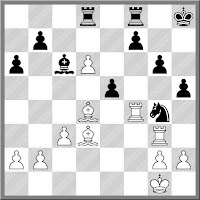 ... h6) this only resulted in the game finishing in 12 moves! Yesterday (4th of March) was the 75th birthday of Danish GM Bent Larsen. In the 60's he vied with Fischer for the title of strongest "Western" (ie non-Warsaw pact) chessplayer, and even played ahead of Fischer in the 1970 USSR v ROW match. Although he was blanked 6-0 by Fischer in their 1971 Candidates match, Fischer's retirement moved him back to the top of Western GM's. Famously Larsen almost always avoided team matches (ie Olympiads) as he felt that playing under team "orders" was antithetical to the individual nature of chess. He was also willing to take risks in his games believing that he earned 2 wins for every loss that occurred. 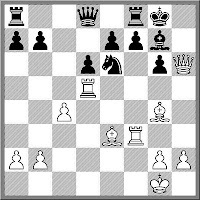 Here is a famous win over then world champion Tigran Petrosian from the 1966 Santa Monica tournament. The famed master of defence is brought undone in 30 moves, and Larsen even gets to throw in a Queen sacrifice. The 2010 O2C Doeberl Cup is only 4 weeks away. At this stage the entry list stands at 118 players over the 4 tournaments, but this will double (at least) before the close of entries. The Premier is filling the quickest, with 56 players registered. This means that there are only 34 places left, to be filled on a first come, first served basis. The Major (Under 2000 ACF) has 29 out of the 80 places field, although the trend in the last couple of years indicates that it will go close to capacity field of 80 players. The Minor (Under 1600 ACF) and the Mini (Under 1200) are also beginning to fill as well. In terms of titled players in the Premier there are 10 GM's, 11 IM's, 1 WIM, 4 FM's and 2 WFM's. The highest seedest untitled player in the Premier at the moment is Junta Ikeda (currently the 7th highest rated player in Australia), who is seeded 24th(!). 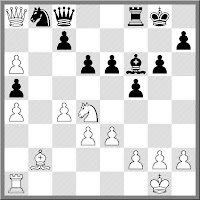 The following game from the ANU Masters shows a nice mating net, involving bishop and knight. 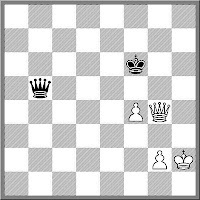 White sacrificed a piece for 2 pawns, connected and passed. Whispers amongst the kibitzers concentrated on whether this would be enough, but Black rendered the discussion moot on move 32 by trapping the king on h3. Then it was a matter of bringing the rook into play, and executing the mate. From this story on Chessvibes comes the news that former World Champion Anatoly Karpov is planning to run for FIDE President. Seems to be a brave choice, unless Karpov is privy to some inside information concerning the movements of current FIDE President Kirsan Ilyumzhinov. For a while there have been rumours that Kirsan was angling for a diplomatic posting from the Russian government, but so far nothing has come of this. In 2006 Bessel Kok ran a high profile campaign for the job, only to go down to defeat. Conventional wisdom was that no one would run against Kirsan in 2010, as the FIDE Congress was to be held in Khanty-Mansiysk, where Kirsan holds the (almost) home field advantage. However if Karpov runs (with the required endorsement of the Russian Chess Federation) it could be an interesting battle. 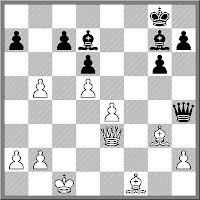 On the other hand Kirsan may repeat his tactic from 2002 and simply offer Karpov a sinecure to not run. A FIDE press release has confirmed important dates for the 2010 Olympiad. The tournament runs from the 19th September to the 4th October 2010. The first and last days are normally for arrivals and departures, so the actual chess will be running from the 20th to the 3rd (I assume). Teams must be registered by the 20th May 2010. One good piece of news for teams is that there will be charter flights from certain cities to Khanty-Masiynsk. For players in the Oceania region the closest city will be Dubai, but as of today it isn't necessarily the cheapest (eg Munich may be a better choice). Nonetheless it will make travel to and from the tournament much easier than having to do the airport transfer in Moscow.